Layout Builder Magic has enabled thousands of Dreamweaver users to build complex, responsive web sites the right way, the simple way, the PVII way. Now, the Layout Builder Template Starter Pack puts the icing on the cake. Leverage the power of Layout Builder Magic in a seamless marriage between flexibility and practicality. Choose your weapon: Automatically create a Layout Builder starter page perfectly suited for use with Dreamweaver Templates (DWT) or opt to create static pages perfect for use with server-side includes, PHP, or .NET includes. Manage repeating site-wide elements such as menus, logos, footers, and base structure, while retaining the ability to customize page to your heart's content. If you use Dreamweaver's DWT features, you've never seen Templates like these. Equipped with several strategically placed editable regions, you'll be able to design your site's pages any way you want, adding additional content above or below your main content area. If you choose a layout with a sidebar, you'll even be able to add content above or below the locked menu! Are Static Pages or Server-Side Includes Your Thing? No problem! Use the LBM Starter Pack UI to instantly create your page, choosing from 5 pre-designed layouts. Are Dreamweaver DWTs Your Thing? 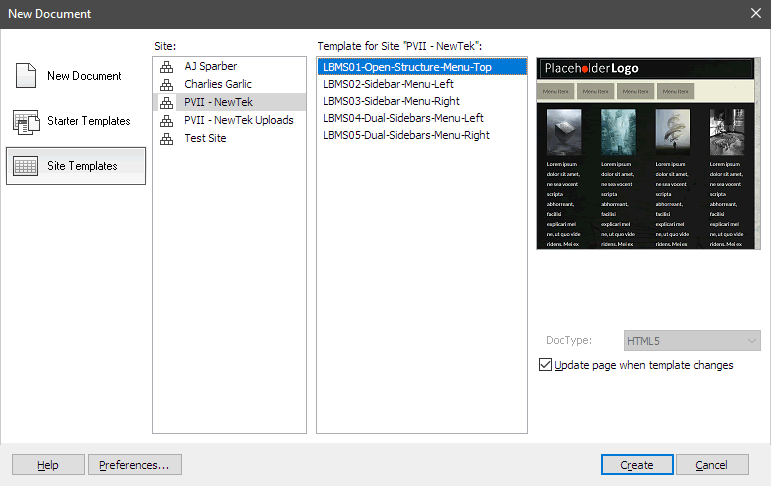 If you prefer using Dreamweaver Templates (DWT), simply click the button labeled Create All Template Files in the LBM Starter Pack UI, and we will deposit 5 DWT files inside your Dreamweaver site's Templates folder (creating the folder if necessary), which you can then access from Dreamweaver's File > New window. The best of both worlds is at your fingertips! Visual user interface (UI) inside Dreamweaver. Pages are always responsive, mobile-friendly, and adaptive. Deploy using Dreamweaver Templates (DWTs), or as static pages. The choice is yours! Choose from 5 pre-designed layouts that can be edited and enhanced using the LBM interface on template child pages! Pages are designed to employ the LBM User Class option, making each page remarkably easy to customize... even if they are linked to a Template. Learn to use LBM and Dreamweaver DWTs to their full potential. DWTs are outfitted with strategically placed editable regions to allow you to add content above or below locked template regions. The masthead/logo section is equipped with a hidden and editable second column, allowing you to easily add additional content such as a hone number or a search box. To get the most out of this product, you should have Layout Builder Magic installed, but it is not required. 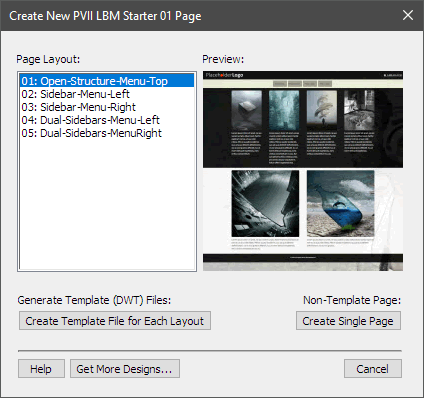 If you don't have LBM installed, you will still be able to make pages. You will simply need to edit the structure manually. LBM adds automation to the process and allows you to easily reconfigure your page's row and column structures. Each page also contains a fully functioning LBM Components menu. If you own LBM Components you will be able to edit the menu using an interface. If not, the menu will still work, but you will need to edit it manually. PVII Pop Box Magic is an indispensable tool that will make your job and your life a lot easier.